As an Independent Hearing Aid Dispenser, we are able to provide a wide range of digital hearing aid brands and models which we will match to your hearing needs, budget and lifestyle. We have always been proud of our pricing structure and aftercare service. The price you pay includes all your aftercare for the lifetime of the hearing system. There are no hidden charges or extra costs such as annual service fees (like some companies charge). We are honest and fair with our prices and all hearing aids come with a 60 day money back guarantee and a 5 year warranty. Saving You Money With The Fairest Prices. Hearing Wales is an Independent Hearing Healthcare Business. We are able to work with all the top global hearing aid manufacturers to deliver the best digital hearing aid system for you and your needs. We can supply our clients with the very latest in technology and hearing aids of the highest quality. It may come as a surprise to know that the same make and model of hearing aid can vary in price from retailer to retailer. Many of our customers have saved large amounts of money by choosing to purchase their Hearing Care Plan from Hearing Wales often saving hundreds of pounds, but sometimes even over a thousand pounds! Find out what you could save by calling us on 01792 650 894. We sell every make and model of hearing aid available in the UK. Hearing Wales has no affiliations whatsoever with any particular manufacturer. We will supply and fit all hearing aids from any manufacturer depending on their suitability to our clients’ hearing care requirements. Even with all of these considerations, we will still be able to offer you a choice of a wide range of hearing aids, and because of this we are confident we will have the best hearing aid for you. Some high street companies, such as Specsavers and Hidden Hearing supply re-branded hearing aids. Please bear in mind that choosing a re-branded hearing aid can make it very difficult to get the aftercare you may need if you leave their services because other companies will be unable to re-programme the aid. This can become very important should you move house, as it can really limit the lifetime of your hearing aid’s effectiveness. With decades of expertise, Hearing Wales audiology professionals have an in-depth knowledge of all the hearing aid models and styles on the market. 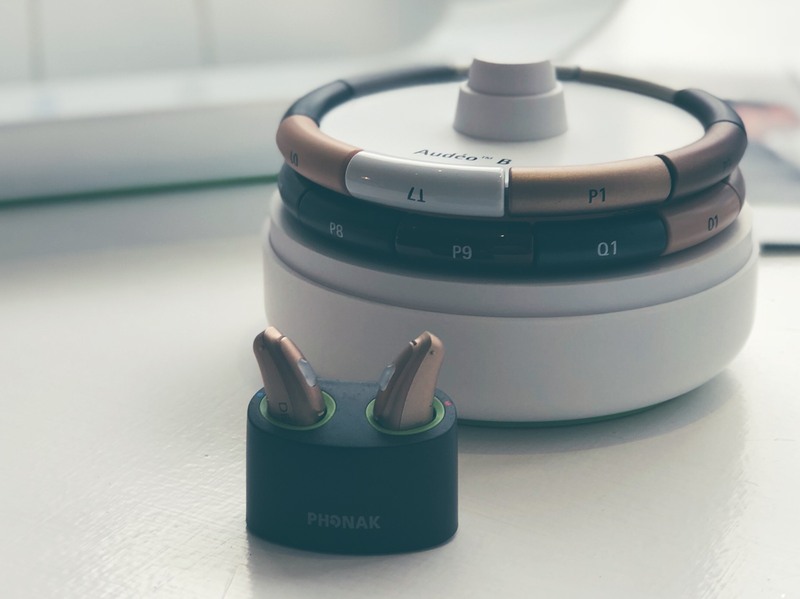 Smart technology is revolutionising the experience of hearing aid wearers, with some models taking multiple readings of the wearer’s environment every second to provide the optimum experience. Newest Models: Phonak Marvel, Phonak Marvel 90 (M90) Phonak Marvel 70 (M70) Phonak Marvel 50 (M50) Phonak Marvel 30 (M30), Phonak Marvel M90-R (rechargeable) Phonak Marvel M70-R (rechargeable), Phonak Marvel M50-R (rechargeable), Phonak Marvel M30-R (rechargeable), Phonak Marvel Smartphone compatible hearing aids, Phonak Marvel made for iPhone hearing aids, Phonak Lyric invisible hearing aids. Phonak Belong Titanium, Phonak Virto B90 titanium, Phonak B70 titanium, Phonak Titanium invisible aids. Models Include: Belong Direct 90 (B90 Direct), Belong Direct 90 (B70 Direct), Belong Direct 90 (B50 Direct), Audeo Belong, Virto Belong, Belong 90 Rechargeable (B90-R), Belong 70 Rechargeable (B70-R), Belong 50 Rechargeable, (B50-R), Belong 90 (B90) Belong 70 (B70) Belong 50 (B50) , Belong 30 (B30), Belong Niada, Venture Niada, Quest Niada, Bolero Belong, Bolero Venture, Bolero Quest, CROS Q, CROS II , CROs B, Venture 90 (V90) Venture 70 (V70) Venture 50 (V50) Nano, Venture 30 (V30), Quest 90 (Q90) Quest 70 (Q70), Quest 50 (Q50), Quest 30 (Q30), Naida S, Audeo Smart, Audeo Mini, Audeo Yes, Exelia Art, Exelia, Versata Art, Versata, Certena Art, Certena, Milo Plus, Milo, Naida, Audeo, Micro Power, Savia Art, Savia, Eleva, Extra, Una, Perseo, Supero, Claro, Audeo S Smart, Audeo S Mini, Audeo S Yes, Ambra, Solana, Cassia, Dalia. Signia NX, 3 NX / 5NX / 7NX , Pure NX, Insio NX, Signia Styletto 3NX, Styletto 5NX, Styletto 7NX, Sivantos Orion2, Sirion2, Intuis 3, Primax 1 (1px) Primax 2 (2px) Primax 3 (3px) Primax 5 (5px) Primax 7 (7px) Primax Ace, Motion, Insio, Pure, Primax Charge and Go, Primax Cellion, Pure BT (Primax made for iPhone). Primax CROs system. Other Models: Orion, Orion 2, Sirion, Sirion 2. Inituis 2, Inituis 3, Sivantos Binax 1, Binax 2, Binax 3, Binax 5, Binax 7, Micon 3 (3mi) Micon 5 (5mi) Micon 7 (7mi) Pure micon, Life, Life micon, Motion micon, Nitro micon, Aquaris micon, Motion XCEL, Nitro, iMini, eClipse XCEL, Aquaris, Siemens Octiv, Life 301, Life 501, Life 701, Motion 301, Motion 501, Motion 701, Nitro 301, Nitro 501, Nitro 701, Signia ITE, Triano ITE, Music Pro, Phoenix, Acuris, Infinito Pro, Cielo, Artis, Intuis, Cielo 2, Cielo 2 Active, Artis 2, Centra, Centra active, Vibe, Pure, Pure XCEL, Pure Carat, Pure Carat XCEL , Pure SE. Other Models: Alta Pro, Alta, Nera Pro, Nera, Ria Pro, Ria, Agil Pro, Agil, Acto Pro, Acto, Ino Pro, Ino, Chili, Intiga, Epoq, Vigo Pro Connect, Vigo Connect, Vigo Pro, Vigo, Dual, Dual Pro, Hit Pro, Hit, Sumo, Go Pro, Oticon Go, Sumo DM, Swift, Tego, Tego Pro, Safran, Delta 6000, Delta 8000, Delta , Syncro, Atlas Plus, Gaia, Atlas, Adapto, Ergo, Chilli 9, Chilli 7, Chilli 5, Agil Pro, Agil, Acto Pro, Acto, Ino Pro, Ino, Intiga 10, Intiga 8, Intiga 6. Oticon Spirit, Spirit Zest, Spirit Synergy, Syncro, Syncro 2, Epoq V, Epoq W, Epoq XW, Canteo 5 ,Canteo 7, Canteo 9, Mondo 1, Mondo 3, Plus 5k, Plus 7k, Plus 9k. Other Models: Acriva 9 , Acriva 7 , Verite 9 , Veras 9 , Verite 7 , Veras 7 , Verite 5 , Veras 5 , Inizia 3 , Inizia 1 , Chronos 9, Chronos 7, Chronos 5, Carista 5, Carista 3, Win, Neo, Xtreme 121, Xtreme 120, Prio, Brite, Move, Avanti, Inizia 3, Inizia 1, Chronos 9, Chronos 7, Chronos 5, Carista 5, Carista 3, Acriva 9, Acriva 7, Supremia 7, Supremia 3, Saphira 5, Saphira 3, Nevara 1. Other Models: Unique 440, Unique 330, Unique 220, Unique 110, Unique Passion, Unique Fusion, Dream 440, Dream 330, Dream 220, Dream 110, Dream Passion, Dream Fusion, Clear 440, Clear 330, Clear 220, Clear 110, Clear Passion, Clear Fusion, Bravo/Bravisimo, Flash, Aikia, Inteo, Real, Passion, Mind, Menu, Senso, Super 440 – Superpower (SP) / Ultrapower (UP), Super 220, Super 440, Superpower (SP) / Ultrapower (UP), Daily 100, Daily 50, Daily 30. Newest Models: Unitron Moxi All (made for smartphone), Unitron Moxi All – R (rechargeable), Unitron Moxi All Pro, Moxi All 800, Moxi All 700, Moxi All 600, Moxi All 500, Unitron Tempus, Unitron Tempus (rechargeable) Tempus Pro, Tempus Pro-R, Tempus 800, Tempus 800-R, Tempus 700, Tempus 700-R, Tempus 600, Tempus 600-R, Tempus 500, Tempus 500-R.
Other models: North Pro (Stride, Moxi Dura/Fit/Kiss), North 800 (Stride, Moxi Dura/Fit/Kiss), North 700 (Stride, Moxi Dura/Fit/Kiss), North 600 (Stride, Moxi Dura/Fit/Kiss), North 500 (Stride, Moxi/ Dura/Kiss),Moxi2, Moxi Pro, Moxi, Quantum2, Quantum Pro, Quantum, Tandem, Passport, Latitude 16, Latitude 8, Latitude 4, 360 Power, Shine+, YUU, Next, Indigo, Element, Liason, Conversa, Unison, Moxi2 Pro /Quantum2 Pro, Moxi2 20 /Quantum2 20, Moxi2 16/Quantum2 16, Moxi2 10 /Quantum2 10, Moxi2 E/Quantum2 E, Max E, Max 6, Max 20. Newest Models: Starkey Muse IQ, Starkey Muse, Starkey Soundlens, Starkey Synergy, Starkey Halo2, Starkey Muse i2400/2400, Starkey Muse i2000/2000, Starkey Muse i1600/1600, Starkey Muse i1200/1200, Starkey Muse i1000/Starkey Muse i1000. Other Models: Z Series, Z Series i110 / Z Series 110, Z Series i90 / Z Series 90, Z Series i70 / Z Series 70, Z Series i30 / Z Series 30, Z Series i20 / Z Series 20, Soundlens2 110, Soundlens2 90, Soundlens2 70, Halo i110, Halo i90, Halo i70, Halo, 3 Series i110 / 3 Series 110, 3 Series i90 / 3 Series 90, 3 Series i70 / 3 Series 70, 3 Series i30/ 3 Series 30, 3 Series i20 / 3 Series 20, Soundlens, Xino, Xino i110/110. Xino i90/90, Xino i70/70, Xino i30/30, Xino i20/20, , Xino Tinnitus, Wi Series, Ignite, X Series, Ignite 20, Ignite 30, Soundlens IQ, S Series iQ, Zon, Destiny 200, Destiny 400, Destiny 600, Destiny 800, Destiny 1200. We are offering 0% on hearing aids at Hearing Wales. Not just that, we are offering interest free hearing aids with 0% deposit. You can pick your re-payment terms with payments made over 6, 12 or 18 months, whichever suits you and your budget best. Behind-the-Ear hearing aids contain powerful components and the latest technology in a traditional shell. they are attached to a custom made ear mould and fit comfortably behind the ear. The receiver-in-canal model is a new development in hearing aid technology. Similar in style to both the Behind the Ear and the Open Fit, it differs by the positioning of the electronic receiver. A receiver in the canal aid has a smaller external housing, as the speaker is placed within the ear canal, offering a more natural sound and very comfortable fit. It is a discreet yet powerful model of hearing aid, offering superior noise reduction technology. The ‘Full Shell’ is the largest of the in the ear hearing aids and is custom made to fit in the outer ear. This design offers many advantages for people with a more severe hearing loss, including volume controls and powerful amplification. . The “Half Shell” is a is a more discreet, customised hearing aid which fits at the entrance to the ear canal. The half shell offers an impressive range of features despite its reduced size, including two microphones, personal volume control and optional Bluetooth compatibility. Completely in the Canal (CIC) aids can offer a discrete and practically invisible style, well suited for those looking for an aid with cosmetic appeal. Hearing quality is not compromised by the small size, as the microphone sits within the canal offering a natural sound comparable to regular hearing. Technology in the field of Completely in Canal (CIC) hearing aids has been rapidly evolving for over 20 years. Recently, the frontier for total invisibility of hearing aids has been extended even further with manufacturers being able to create an Invisible-in-Canal (IIC) hearing aid. IIC’s can sit much deeper in the ear canal than ever before. Hearing aid technology is constantly getting smarter and more discreet, giving users an ever-better interaction with their environment with small, stylish aids in the latest materials. If you have a problem with your hearing but are unhappy wearing a traditional type hearing aid, then the La Belle could be the digital hearing aid answer for you. La Belle comes from Bruckhoff, experts at putting hearing aids onto glasses. Now they can fit a digital hearing aid onto your glasses! Their hearing aids are nearly invisible because they are hidden in the arm of your spectacles. The precise technology is tried and trusted and they have refined it even more with their latest generation of the digital La Belle. The glasses are attractively styled and few will guess that they contain a high-quality digital hearing aids. So if you feel you are missing out when you are watching TV or going to the theatre, cinema, meetings or out shopping then take a look at the La Belle, it could bring the joy of living. A number of instrument types are available from Bruckhoff to suit most types of hearing loss, including RICs for mild to moderate loss, AC for moderate to severe loss and BC for conductive loss. The instruments can be attached to any number of frames that have been adapted. You can have them attached to your long distance glasses when you’re driving, reading glasses for close work or even your sunglasses. Why don’t you contact us at Hearing Wales to make an appointment?